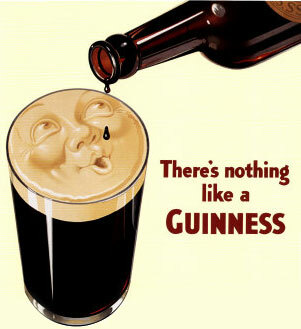 The history of Irish Guinness Stout began when Arthur Guinness was born in Celbridge, County Kildare, Ireland. He was the son of Richard Guinness, land steward to the Archbishop of Cashel. Beer was already in his blood as his father is said to have brewed beer for the Archbishop's estate workers. Arthur started brewing in the town of Liexlip about 17 km from the center of Dublin. Arthur had big ideas and dreamed of having a brewery under his own name in the big city. In 1759, he purchased a dormant brewery in Dublin with £100 that had been bequeathed to him from his godfather, the Archbishop. Arthur signed a 9,000 year lease on the brewery, with an annual rent of £45. In the 1770's, a new popular drink with the market porters at Covent Garden in London was being exported by London brewers to Dublin. Arthur Guinness was brewing ale at the time; however, he decided to try his hand at the new 'Porter', which resulted in more of a success than other Dublin brewers. Expansion into exporting to foreign markets was spearheaded under the guidance of Arthur's three sons, who succeeded him in the family business. Before the close of the 19th century, the Guinness brewery was the largest in the world and the company, Arthur Guinness and Sons, was opened on the London Stock Exchange. By this time, Guinness was introduced into markets as far as America, Australia, the Far East and Africa, often with cooperation from local brewers, making the brand the global icon it is today. The specific recipe of this world famous product is a closely guarded secret. It is made from a combination of water, barley, malt, hops and brewer's yeast. Despite the myths, the water doesn't come from the River Liffey. It is from Lady's Well in the Wicklow Mountains and the barley is, of course, Irish-grown. Guinness is almost as much about its serving as its production. For the perfect pint, tilt the glass to 45 degrees and carefully pour until three quarters full. Then place the glass on the bar counter and leave to settle. Once the surge has settled to perfection, fill the glass to the brim. This is the legendary Guinness 'two-part pour'. It takes 119.5 seconds to pour the perfect pint. One thing is never in doubt - Guinness is worth the wait. 1998 was the launch of Guinness Draught in cans, known as the first 'widget' beer. Three years later it won the Queen's Award for Technology Achievement. Also in 1998, The Guinness Storehouse opened as a visitor attraction. It is now Ireland's leading site, welcoming over 750,000 visitors every year and recently celebrated its three millionth visitor. The Guinness 'Surfer' advertisement was voted best television commercial of all time in 2000 by The Sunday Times newspaper and Channel 4. 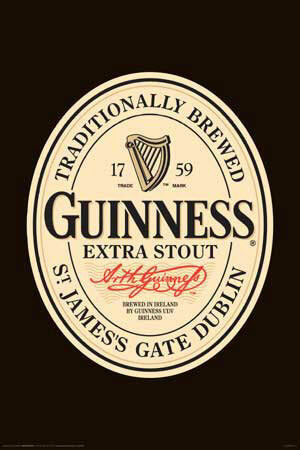 Brewing of all European Guinness returned to the company's historic St. James Gate brewery in Dublin in 2004. In 2007, Guinness Red in Great Britain was launched. Made from the same raw ingredients as Guinness Draught, Guinness Red uses lightly roasted barley to create a substantial beer with a distinctive red color. There are two main Guinness variants: Guinness Draught and Guinness Foreign Extra Stout. Guinness Draught, sold predominantly in Europe, North America, Japan and Australia, is available as Guinness Original, Extra Cold, Extra Smooth and, most recently, as Guinness Red. The legacy that Arthur Guinness left behind was the most popular and well known stout in the world; and it's most important secret ingredient was Arthur Guinness himself.